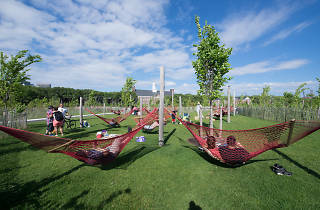 Governors Island has truly raised the bar for outdoor entertainment this summer! During the warmer months, New York’s car-free oasis is the perfect place to spend a day in the sun, and we’re about to share an incredible list of reasons why it’s considered one of the best NYC parks for things to do outside. After launching The Hills—a 10-acre park equipped with slides for adults and hill-y landscapes offering unreal 360-degree views of New York Harbor—last summer, the Trust for Governors Island has just announced new and exciting additions for the 2017 season. 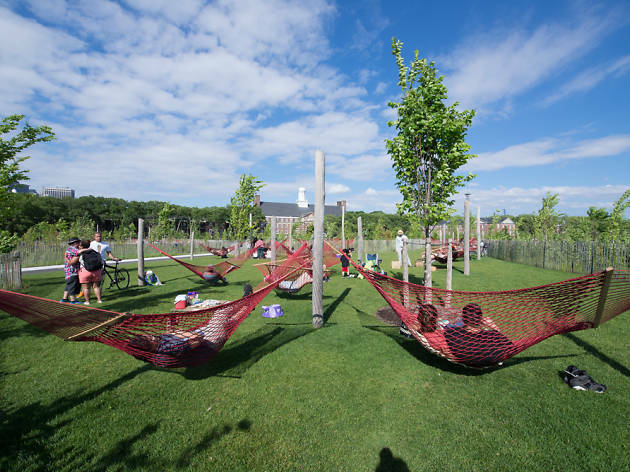 One of the biggest changes worth noting is that Governors Island will open one month earlier than usual (opens Monday, May 1), which means New Yorkers get to enjoy the perks of this scenic treasure for an extra month! But that’s not the only pleasant surprise. Check out this list of new attractions below! For the first time ever, Governors Island will host the Holi Hai Festival of Color during its opening weekend. If you’re not familiar, Holi Hai is a party celebrating the coming of spring through live music and dancing, while allowing guests to throw rainbow-hued powders on the attendees. Get your tickets here. The New York Transit Museum will schlepp vintage buses via the ferry for visitors to view for free on July 8 and July 9. Governors Island already has an impressive playground, but the landmark has teamed up with Adventures GI to open a climbing wall, a maze and a ziplining adventure within the Island’s Western Development Zone near Liggett Terrace. Just imagine that killer view of the Statue of Liberty while soaring through the island breeze! Two-wheeling fiends already know that Governors Island offers amazing bike paths. Visitors are welcome to BYOB (bring your own bike), rent or hit up the Citi Bike kiosks, however visitors can also borrow a bike for free for an hour between 10am and noon every weekday. New beer garden and oyster bar! FYI: There are at least two dozen food vendors serving delicious fare on the island—think El Carrito Rojo, Blue Marble Ice Cream, The Pocketful and more. Boozehounds can also appreciate the island’s two beer gardens (Little Eva as well as a watering hole by veterans Alphabet City Beer and Co. and Edi and the Wolf). But guess what? Governors Island is gaining a third! Opening early this summer, Island Oyster—a pop-up oyster bar and beer garden from the folks behind Grand Banks—will serve amazing seafood and offer fabulous cocktails. The bar will also remain open past the park’s regular hours, which means you can take in those amazing sunset views with a beer in your hand. What bliss! Don’t worry—Governors Island is still a free attraction, but the landmark is launching a new membership program, which will come in handy for frequent visitors. Starting at $50 annually, the perks include season-long free ferry ride service, special insider access, invites to exclusive members-only events, free bike rental and discounts for select island vendors. Sign us up! The island will also continue to host beloved events such as FIGMENT’s weekend of immersive art, the iconic Jazz Age Lawn Party, a rosé festival called Pinknic, the Brooklyn Music Festival and more. Stay tuned for more announcements on those can’t-miss bashes.